Vanessa Rapisarda is a 34 year old stay-at-home mom of three kids, ages 7, 5 & 2. 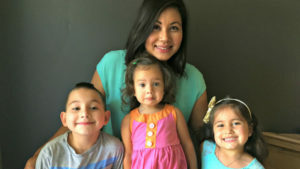 Since her battle with postpartum depression after the birth of her second child, Vanessa has become a strong advocate for postpartum depression awareness and helping other mothers tell their stories. My parenting journey got off to a rough start. I was a newlywed with hopes and dreams of starting a family and it wasn’t as easy and beautiful as I imagined it to be. My first pregnancy ended in a miscarriage at 8 weeks. I knew there were always risks involved and my family and friends assured me that it happened more often than I knew. When I got pregnant again a few months later, I was more cautious and waited until I got through the first trimester to get my hopes up. But sadly, I miscarried again at 16 weeks. I was pregnant again a month later, but refused to acknowledge it. I started experiencing the worst morning sickness of my life and my doctor reassured me that it was a good sign of a strong pregnancy. But I still had my doubts. And then one night, when I was around 10 weeks along, I woke up in a pool of blood and knew immediately I had miscarried again. But an ultrasound confirmed that was not true. I had a tear in the placenta which caused the bleeding and landed me on bedrest but that baby was as healthy as it could be. That baby is now a brilliant 7 year old boy. I expected to have a whole bunch of kids and love being a mother every second of every day. I had wanted to be a mother my entire life. I’ve always had a strong maternal instinct and taking care of others was something that just came naturally for me. I still love being a mother and I am still happiest when I am taking care of my family, but I had no idea how exhausting it would be. I had no idea how much I would HATE being a mother some days. Figuring out which rules my husband and I wanted to enforce with our children. We knew that we would always be strict about sleep training and having a good bedtime routine because we didn’t want to struggle with that forever. Family dinners are also a big deal in our house because they’re one time of the day when we are all together. It’s not always easy enforcing those rules, but knowing what type of humans we wanted to raise was a no-brainer. We spend a lot of time teaching them manners and respect and tradition and speak very openly with our children about life. I’ve had several struggles throught my parenting journey. With all three pregnancies I suffered from hyperemesis gravidarum (an extreme form of morning sickness) and had to be hospitalized. With my second child I suffered from perinatal and postpartum depression. And then I was diagnosed with endometriosis and told it could cause infertility, however, I ended up concieving a third child anyway. I’ve since undergone a complete hysterectomy to treat the endometriosis, and the recovery was not easy with three kids to look after. My husband has always been a huge help to me through everything. Despite the fact that he works a very demaning job, he always puts the family’s needs first. Our families are also very supportive however we don’t live in the same city anymore, so it’s been difficult to manage things without their constant help. Since I’ve struggled with postpartum depression for the past five years, my kids and I have seen many “tough days” together. I’ve talked openly to them about how sometimes mommy gets into bad moods and it’s not because of anything they’ve done, it’s because mommy is sick and is still trying to get better. When I’m having a really tough day, my older kids know to give me some space and they take the toddler and entertain her for a while. Knowing that I’ve raised such responsible and independant children makes me realize that some days I feel like a terrible mother, but I’m actually a pretty awesome one. When I overhear my children playing “house.” It’s a great way to get a glimpse of what my kids think of me and my husband, because they imitate everything we do. They call eachother nicknames like “hun” or “babe” and the mom always seems to be bossing everyone around and the dad always seems to be fixing things. Since becoming a parent, I’ve been faced with a lot of tough decisions and I see them even more so in the blogging world. Many topics are controversial and lead to heated discussions because each parent feels their opinion is the right one. But if there’s one thing that I’ve learned in my years of parenting, it’s that there is no black and white, instead it’s just a whole bunch of grey areas. Once I got past the idea of “doing something wrong” and accepting that I just needed to do whatever I thought was best, I became a better parent. I made decisions based on what worked for my child and my family and not based on what everyone else was doing or what the experts said was best. So far, it’s worked out really well.